A health energetic body, including the chakras, is key to a healthy pattern of spiritual development. Starting with a brisk discussion of chakra form and function. We look at both the helping and hindering aspects of each chakra and discuss what can be done to help balance the energies in ourselves and others. Working with a combination of mediation and guided imagery we will examine each chakra, discuss healthy function as well as the helpful and hindering aspects of the chakras. Starting with a brisk discussion of chakra form and function. We look at both the helping and hindering aspects of each chakra and discuss what can be done to help balance the energies in ourselves and others. The second portion of the class focuses on guided meditation and partner work to look at our own chakras as well as other peoples with the goal of better understanding these energy centers and their purpose. Workshoppers should wear comfortable clothes as we will be doing breathing exercises and, very, light stretching to help energy flow and balance. Check the Upcoming Events to see when this class will be offered or contact John to schedule a workshop in your area! Do you want to open your third eye and see the unseen? Do you want to learn the spiritual tools needed to heal your energy and heal your life? 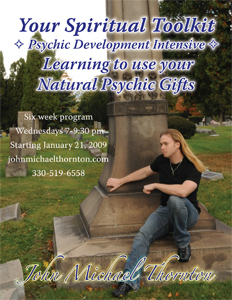 In this seminar, Psychic and Life Reader John Michael Thornton will teach you to identify and unleash the spiritual power that resides within each of us. I started seeing Auras when I was fifteen. In this class I help people see and feel auric energy for themselves. Beginning with a brief overview of the aura and its component layers, the chakra connection and color meanings and interpretations. By focusing on the connection to physical and spiritual health we give students a vocabulary to describe what they will see and feel during the experiential portion of the program. The second half uses my Seven Steps to Center to enter a meditative state conducive to seeing and reading auric energy. Working with a partner and a variety of colored pencils we then draw pictures of each other's auras. Actually working with colors and drawing materials takes away some of the self imposed blocks and frees up the natural creative forces. Each student receives an Aura workbook to take home for further study. Colored Pencils and drawing paper will be provided, but artists are free to bring their medium of choice! Understanding the connection between your chakra system and your physical health and well-being. Body, Mind, and Spirit are One. Imbalances and disruptions in the spiritual body are mirrored in the physical and vice versa, understanding how your spiritual well-being is reflected in your physical body is the simplest way to understand physical and spiritual balance. We will briefly look at how the chakras connect to the physical body, teach you how to diagnose and understand those connections and look at ways to begin finding balance in your physical and spiritual life. In the second half of the class we will explore ways to discover imbalance and blocks in your energy body through muscle testing, pendulums, and color. Finally, we will use guided meditation to explore the chakras, bring healing, and flow. Part one is available as a lecture.